Written and Illustrated by too many creators to list! 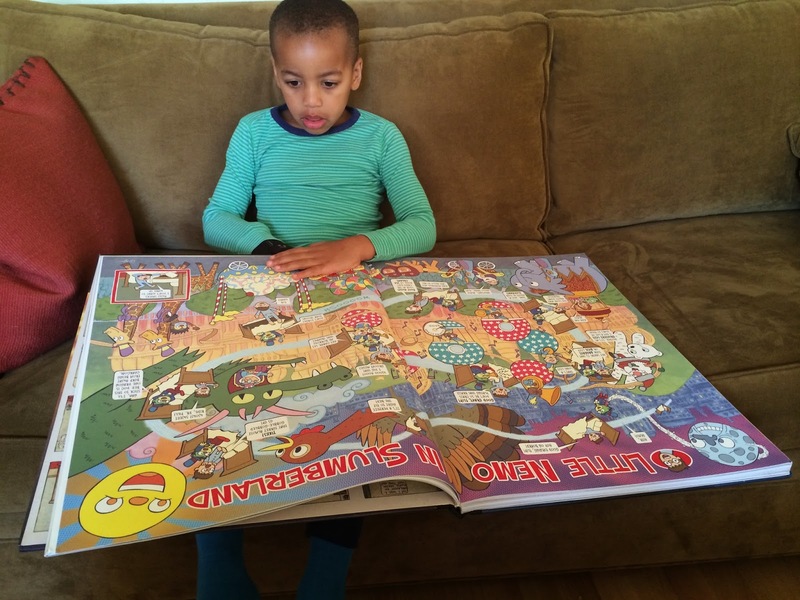 In the fall of 2014, Locust Moon created an immensely successful kickstarter for an anthology celebrating the world and work of Windsor McCay, creator of Little Nemo, an innovative newspaper strip that has inspired countless creators over the generations. I had the privilege of seeing some of the originals before it was produced, and they blew me away. Keep in mind, this isn't some McSweeny's "put on your bookshelf and look cool" deals. Little Nemo Dream Another Dream is HUGE, done in the same size as McCay's original art. It's more akin to IDW's Artist Editions than, say, Dark Horse's Warren reprints or Marvel's Masterworks series. There's a cost attached to that, of course, but you are definitely getting what you paid for. Here's an idea of scale, with two-page spread. When the final product was introduced, I couldn't believe some of the people they'd involved. It's a murder's row of talent, with everyone from Paul Pope to Paolo Rivera getting into the act. Indie comics folks like Box Brown were rubbing elbows with notable superhero artists like J.H. Williams III. Together, they put together a book that's an homage to be reckoned with, because I'm not sure we've ever seen anything like this before--or will again. Part tribute, part parody, part take-off point, the creators do so many different things with McCay's world, whether it's to imitate his style or put their own characters in the place of Little Nemo. The sheer variety of takes is what really impressed me. While there are some overarching themes--dreams, of course, being the big one--how these creators approach these themes is what puts this above other, similar projects. While they can veer pretty far from McCay's style or structure, there's just enough commonality to link them together, but still not feel like "Oh here's another 12-panel page with thin lines." I'll admit my favorites tended towards those who either stuck most closely to McCay's original intent or use it as their take-off point, but even those that are barely tied to McCay are extremely well done. I was given the honor of receiving a digital copy of this book so I could review it. It's not the same as seeing it in the flesh, to speak, but even in PDF form, the high production values shined through--I had no trouble reading the text or lingering on the visuals. I didn't even try to review the entire contents, but here are some thoughts, which hopefully give you a good feel for the insides of this thing. The use of a main image to anchor the story is one of the recurring themes of the anthology. Nate Powell uses a wave for his, for example, and in the case of David Plunkert, Nemo explores a giant, art-deco-like smoking man, who forms the backbone of the thin-line illustration. Dave Chisholm uses a jazz horn. James Harvey really had some fun with putting his page together, shaping it across the side of a skyscraper as Nemo floats near buildings in his dream-state. Those little panel numbers sure came in handy for this one! When Bishakh Sorn did their work, it ended up positively Escher-like, with the character walking through a dream that circled in on itself, using the same thin style as McCay. For their contribution, Moritat has Nemo dream of dragons, which shape the nature of the page's frame, in anticipation of heading to China, moving the setting and creatures into a non-Western setting. Panel borders are another common theme to be explored. Typical is J.G. Jones (with colors by Jose Villarrubia), who gets an extended take, starting off with a full-page splash, then playing with the idea of scope and scale by using panel borders to explain how we can better focus our ideas, but beware of limiting our imagination. He changes his look to really mirror McCay, and the night sky that reoccurs through every page allows the reader to focus on the actions of Nemo and Flip. It's one of my favorites. Peter and Maria Hoey's page. 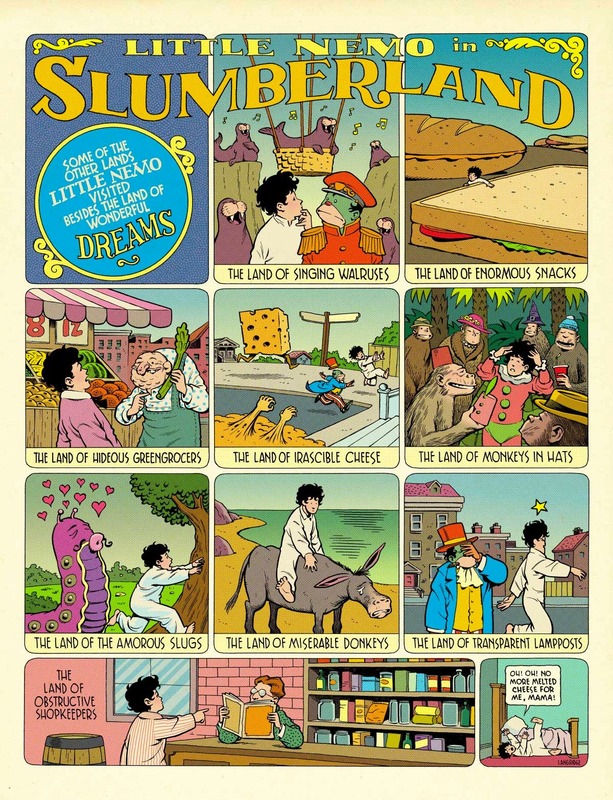 Alternative takes on the concept included puns, such as Peter and Maria Hoey's "Little Nemo in Coin-Op Land" where he explores a public laundry machine, rolling around the grid-style page like a colorful sock, or Andrea Tsurumi's take, where characters from Nemo's world go shopping in slumBRAland. The latter is especially notable, because the coloring choices and linework really invoke the feel of an early 20th century comic. Naturally, such jokes frequently were highlights for me, as I love puns, especially when accompanied by a visual flourish that aids in the joke. 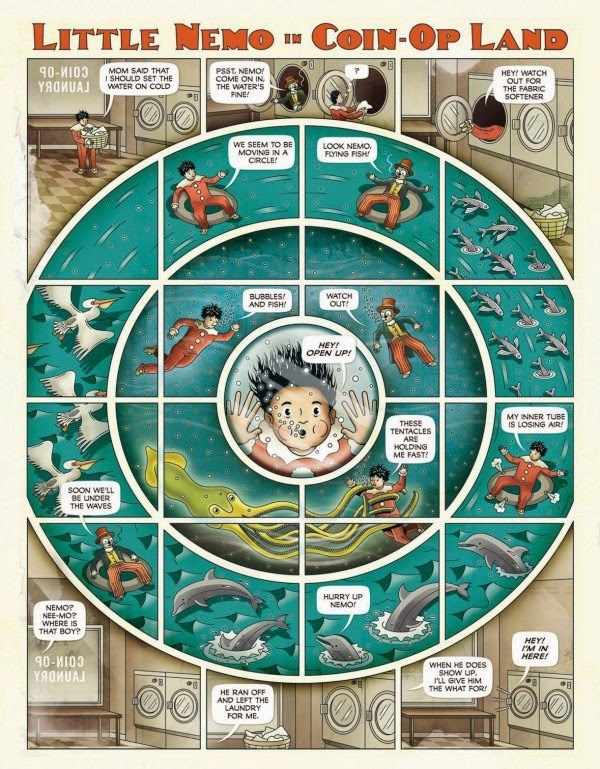 There are some interesting spins on the anthology theme, too, such as Zander Cannon's decision to recast Nemo as a Japanese boy, who dreams of fighting kaiju but finds reality more of a pain, or Fil Barlow's decision to make his tribute about Windsor McCay, creator rights, and tongue in cheek reference to the public domain. Barlow opts for a look that's closer to an old editorial cartoon than Nemo, while Cannon mixes their own style with a color scheme designed to look more classical. Nemo gets a gender change courtesy of Ramon K. Perez, who uses McCay's structure, but opts for a more animated-style approach to the art. Alexis Ziritt gets cosmic and Kirby on their page, which features a large illustration in brilliant color and plenty of Kracle, turning Nemo into a figure of the dead who sleeps in a coffin! The most dramatic change might be from Stephen R. Bissette, who makes Nemo a dinosaur (his Tyrant character) in the course of an illustrated poem that features words mixed across images of the Mesozoic creatures living and dying. The dinos are very realistic, and they mesh right into the text, guiding the reader along, with Chuck Forsman providing the bright colors for the art. Some of the stories really move away from McCay's style, but that's okay. Maelle Doliveux also plays with the idea of gutters, as Nemo engages in a race across the page, zigging and zagging from top to bottom. They use collage art, giving it a three-dimensional feel, but the lack of backgrounds--a hallmark of most of the others in this anthology--hurts it a bit. There are times when Nemo is present, but he's joined by an outsider. Cat lovers will enjoy Carla Speed McNeil's dream, where Nemo is carried by a giant cat into its world, where the sky is beautiful and kittens have very sharp claws. The size of the cat is displayed by the tight fit inside every panel, and the ending will be something all cat owners will know all too well. Meanwhile, R. Sikoryak puts Freud into the equation, which is such a great idea I'm shocked we didn't see it before. The style of Sikoryak is right out of a 1920s comic page, right down to a combination of speech balloons and bottom-panel narratives. Freud does just what you'd think, of course, and Nemo wakes upon his couch. Farel Dalrymple's exquisite watercolors, with the world "Slumberland" mixed in with the cityscape, Eisner-style, opens things with a pop, taking Nemo across rapidly-changing backgrounds, some which bleed across multiple panels, ending with a reference to Nemo being inspired to create his own drawings. P. Craig Russell was basically born to do a tribute like this, as his pages already have a lot in common with McCay's structure. In his section, he tempts Nemo with staying in a slightly nightmarish dream world, going with cool blues and angular characters that float around and push Nemo towards the borders of the panels. It all ends with a little nose tweak of one of Russell's creative partners, too, which was really cute. Leave it to Rafer Roberts, though, to turn Nemo into something demented. He takes Nemo, Flip, and a doctor into the underworld, where they try to escape various devils and monsters, meet a fertilizer giant (nice inside joke, Rafer), and in the end, are condemned to death. Vividly colored and featuring Roberts' signature style of tight lines, it ends with Nemo opting to never sleep again. No wonder! 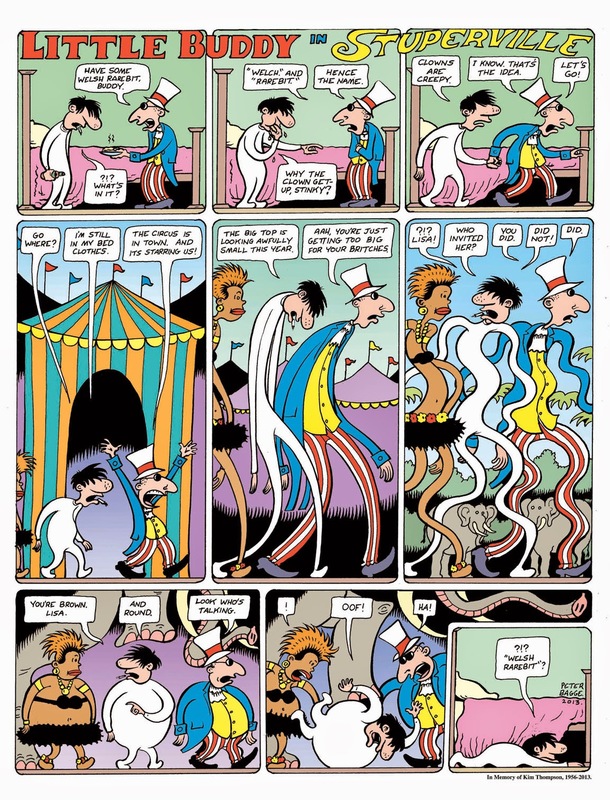 Peter Bagge's version becomes "Little Buddy" as he uses his alt comix character instead of Nemo, stretching the bounds of imagination as he lengthens Buddy and company, allowing for a few good punning lines as he takes advantage of the idea of a dreamscape. It's an odd combo of McCay and Bagge, but it was a highlight for me. Jamie Tanner uses a different technique to mix his own creation, The Aviary, with McCay's, having Nemo dream again, but finding his visions mixed with those of a strange, bird-faced creature. Tanner's shading that gives his work an old-fashioned look really works well here, as did the muted coloring in shades of red and turquoise, mixed with blacks. Kelley Jones wasn't someone I expected to encounter here, but I'm always happy when I get new stories from his expressive pens and pencils. Here, Nemo is re-cast as a pulp adventurer, fighting against sheet monsters who become giant Pterodactyls, then morph to more grounded situations, where Nemo must rescue the jungle maiden and escape in a space ship! Nemo is the hero in these adventures, clearly inspired by the writers of the 1930s. It's a wonderful sense of whimsy and imagination, and Jones' flowing lines really make the shifting scenes believable. Great stuff! Jill Thompson brings in Scary Godmother to teach Nemo why eating Halloween candy before bed ia bad idea. He's attacked by bats, then saved by his candy--except he's now on the snacking menu! Some nice perspective work, and of course, glorious watercoloring from Thompson. Mike Allred is another creator who's basically tailor-made for doing a McCay tribute. Nemo is swapped out for Madman, who walks clockwise, starting on roller skates, then records, himself(! ), television, and finally a lunar surface that leads him to his love. It's so sweet, symmetrical, and decidedly Allred. Roger Langridge didn't pick one dream for Nemo, so he sends him off to visit everything from the land of enormous snacks to monkeys in hats and invisible lamp posts, giving a sense of broad comedy to the proceedings, and another personal highlight Mimicking a comic strip is no change for Langridge, who often works in this grid style. I'm not going to lie. $124.99 is a lot of money, and I know many can't afford this. *I* can't. But if you are financially able to handle the cost, you love the medium of comics, and you want to see over 100 creators doing some of the best work of their careers, this is something you really must own. It's brilliant, it's amazing, and it's everything comics can be, all between one set of oversized covers. 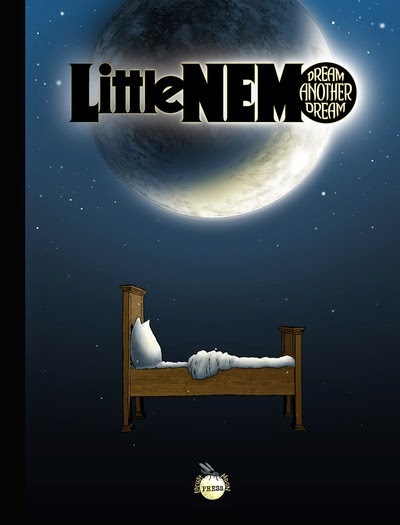 You can get Little Nemo Dream Another Dream here.